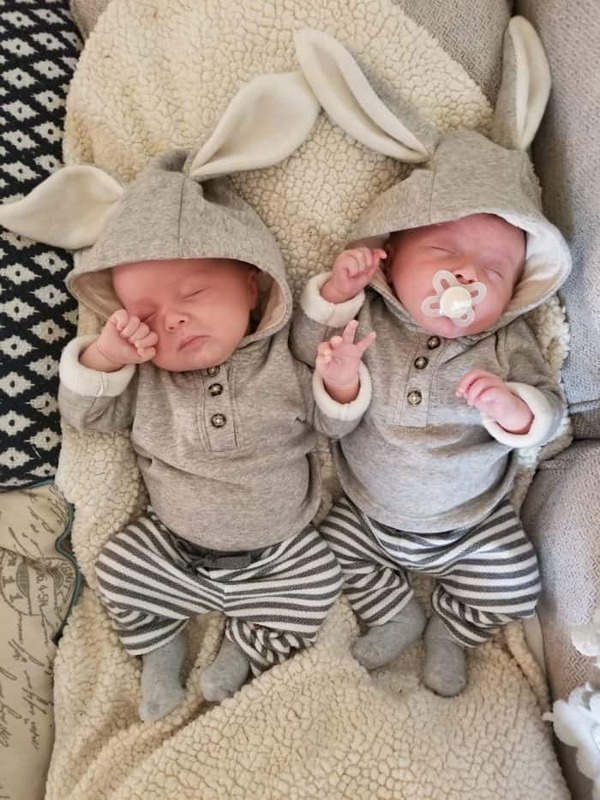 On the eve of Maxwell and Henry’s first birthday, I decided it was time to sit down and write My Twin Birth Story. The twins came quickly, no time for medicine or planning. Please follow me on Instagram where you can see much of our every day life as a family of seven. On occasion, you will see updates on our Facebook page or even on our Pinterest page. 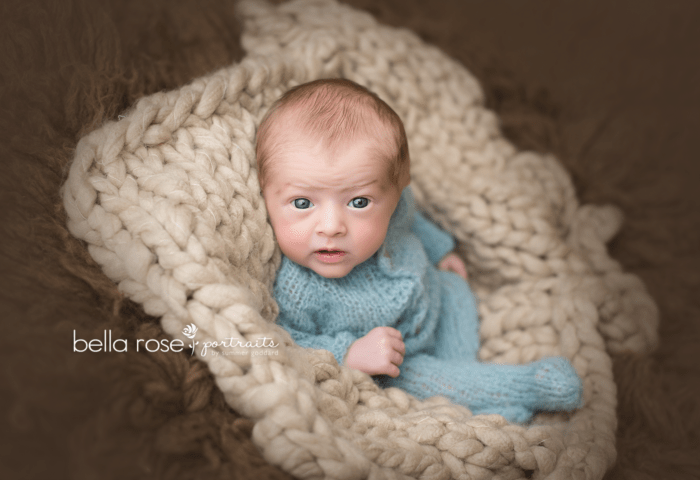 I have never sat down and given a birth story. Maybe because the labor of my first three babies was pretty average… ha ha, what is an average labor? In my case with all three, I began contracting, I labored some, I eventually got an epidural, the doctor broke my water and after a few pushes I was done! Easy, peasy – right? Well, they were compared to the twins. June 16, 2017, we learned were were pregnant with twins. It was clear to me, before discovering we were having twins, this pregnancy was different. It didn’t occur to me there were two babies inside me. In the past, I always knew what I was having before any ultrasounds told us the truth. A boy or a girl. Each pregnancy was pretty predictable. With the girls, I was nauseous almost from the date of conception until the end of my second trimester. With my first boy, I couldn’t eat my entire first trimester. I was tired and had no appetite. They just were different experiences, and I knew it. 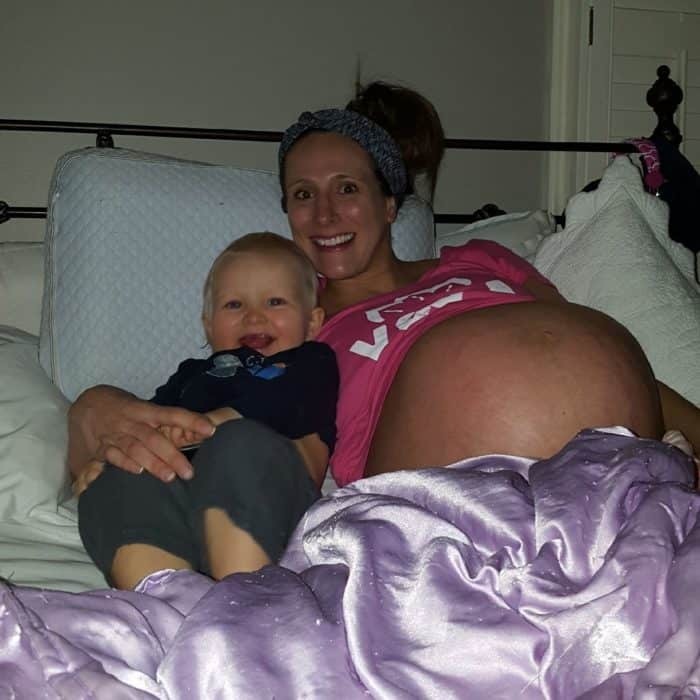 When I was pregnant with my twin boys, however, I didn’t know what was going on. I was showing almost immediately. I mean showing by week 4 or 5. I was also starving… constantly. I could not get enough food in me. And I was tired. I thought I had known tired from pregnancies before. This was pure exhaustion. I had less nausea though and was completely baffled by what this baby was. I assumed all signs were the result of maternal age and having two pregnancies back to back. Yes. 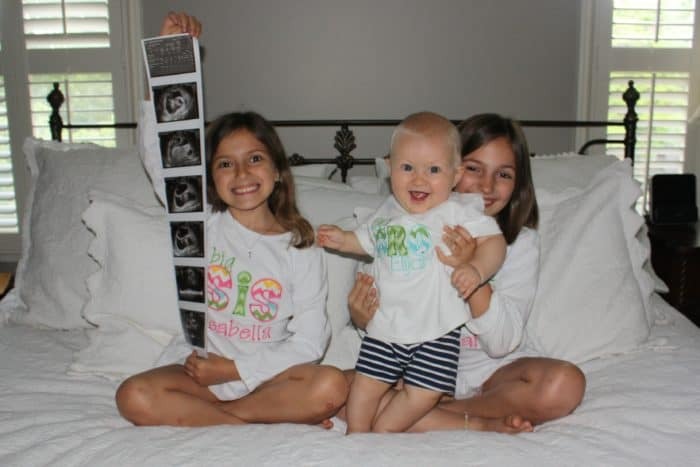 With my first three pregnancies, I always asked the ultrasound technicians to make sure there was only one baby in my womb… I was a bit terrified of twins. My dad was a twin. His brother did not make it through pregnancy. He was born in Cuba where medical care was very lacking. 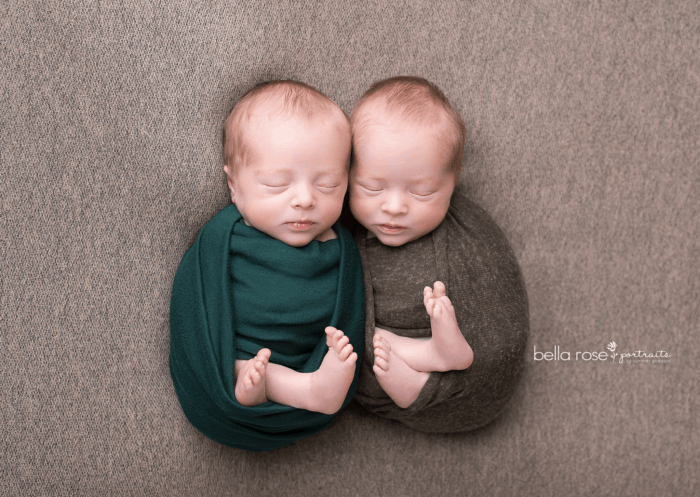 During my fourth pregnancy, though, it never even occurred to me that I would be having twins. So at nine weeks, I entered the doctor’s office, with my husband and seven month old son, Elijah, in tow. I was eager to hear how our “single” baby was doing. The wait as the doctor’s office was exceptionally long. We were placed in the ultrasound room and then quickly escorted out with no ultrasound. The nurse apologized and explained that the doctor had to check a twin mom out on the only working ultrasound machine. 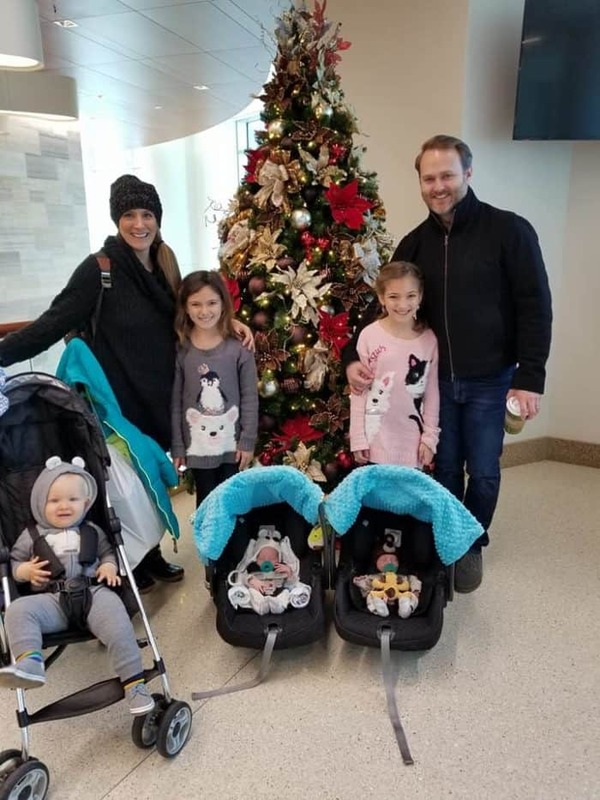 She stepped out of the room and I looked at my husband, Wes, and said “We could have twins.” It was a flippant response, given without a real thought to the possibility. It was the only time I mentioned it during this pregnancy. We never discussed my dad being a twin and definitely never thought that could be us. When the technician returned, we quickly began the ultrasound. We were already late, and I just wanted to hear a heart beat and go home and put Elijah down for nap. The tech put the display of my uterus on the screen and said nothing more. Silence. As she worked, I clearly saw two sacs on the screen and immediately began to cry. My husband was rocking Eli in the corner, completely confused by my tears. I began squirming as fear sunk in. She exclaimed, “hold still, I have to make sure there isn’t a third.” Wes realized what was going on. We were expecting twins! Rather quickly, we had a lot of testing done because of my age and because were were having twins. These test were paired with frequent ultrasounds, and it was early on that we learned the gender. The boys were Dichorionic/Diamniotic (di/di) twins meaning they were in two sacs. Di/di twins are the most common type of twins. They can be identical if the egg split very early, but fraternal twins are always di/di. Because my dad is a twin (genetics), we strongly believe they are fraternal. There is a possibility of them being identical, and we will check when they are old enough to enjoy the results too. They sure look alike! At 27 weeks, my husband and I went on a date and my uterus would not stop contracting. I did my best to breath. I kept emptying my bladder. There wasn’t any resolution. I feared calling the doctor, but I knew with my age and with having two, I better give her a call. I was indeed in labor. I was given two steroid shots to strengthen the babies lungs and also medicine to prepare the boys for early life. That was a real eye opener. The docs said that, even holding out for 48 hours would significantly strengthen their lungs and improve their chances of a healthy life. Ultimately, that call lead to two nights in the hospital and then bed rest for 8 weeks. During that time, I took a pill daily that was also used for high blood pressure patients. Though I did not suffer from high blood pressure, they found this pill also relaxed the uterus, which delayed labor. While on bed rest, I was given bathroom privileges. I also went downstairs about twice a week for a very brief period of time. Usually one of those downstairs visits was used to go to the doctor’s office. About every other weekend, I took a brief family outing with my family. It was a pretty miserable time, laying in bed, but I used that time to catch up on work and do as much prep as I could in advance. I was fortunate enough to have family move into our home for two months. I Felt Huge. I Was Over It. Every day was an additional day. Each week was another week. My days went no slower than other people’s, but I was over it. Between lying in bed all day and a stomach that was growing quickly, I was not a happy camper. My emotions were everywhere. I felt I was missing out during the most joyous time of the year (Halloween to Christmas) with my other kids. I wasn’t ready to have the boys. I feared the busyness of five kids. I also was very ready to have the boys. I was uncomfortable. Extreme lower back pain. A very heavy belly. In my early 30 weeks of gestation, the boys (together) weighed as much as a newborn baby. It explains why I have never “felt” more pregnant than I did at that time. At 36 weeks, “I” decided I had enough time in bed. 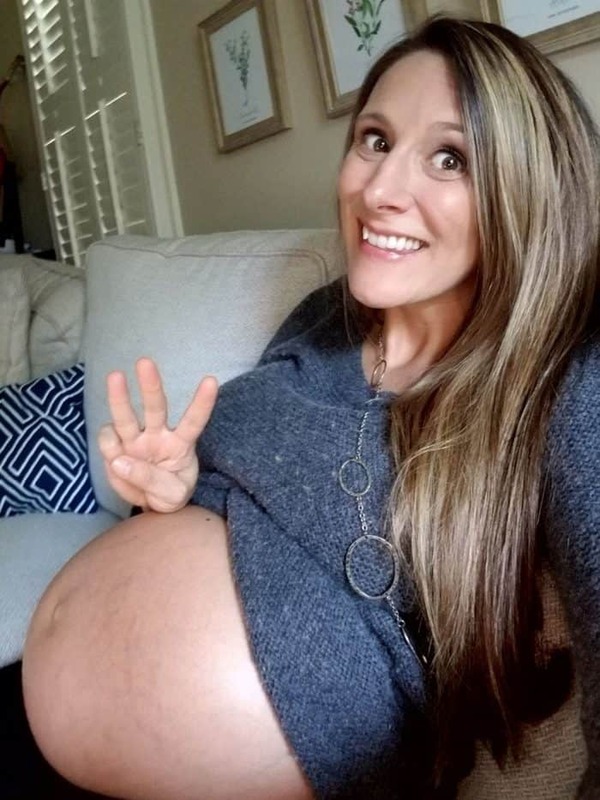 “I” decided that 36 weeks was a great run and I was going to take a date with my husband. You see, we dated weekly up until week 27. I had not dated him again since the early labor. The date didn’t take much physically. We went out to eat. I walked to the restaurant from the road. I took about half dozen bathroom breaks. I felt huge. I felt heavy. I recognized contractions, but I had been having contractions for 8 weeks. I tried to tell myself that I wasn’t feeling different that night. Plus, I didn’t want to hear “I told you so” from my husband or anyone else. I went to bed experiencing contractions but figured, going to bed would be a good thing and would slow them down… it had worked in the past. I went to sleep. While I was sleeping, I felt the pop. I told my husband my water broke. We both had become light sleepers over the past few weeks. I stood up to use the bathroom but there was no continuing of the water leak*. I told my husband I made a mistake. I changed my clothes thinking I must have had an accident and laid back in bed. The water immediately began flowing when I laid down. It was clear, my water did break, and Wes jumped out of bed. *I learned later that as soon as I stood up out of bed, Henry’s (Twin A) head created a suction as he dropped blocking the water from leaking. When I laid down again, the suction broke creating more water flow. It was December 22 at 1:15 am. We rushed out the door. I lie. My husband rushed out the door. I stood there in the hallway not knowing what to do with my leaking water. My water had never broken naturally. My husband was rushing me, and I was telling him we have time. I am grateful for his rushing. There Goes the Birth Plan. Our birth plan was messed up. We wanted to birth the twins vaginally, but not many doctors were experienced or willing. It was the holiday season, and we knew our carefully selected doctor was out of town. On the drive to the hospital, my husband begged me to call the OBGYN practice. I again told him that it was okay to wait for the hospital to do it, but I was not in a place to argue. I listened to his advice and left a message with the doctor on call. We arrived at the hospital by 1:40 am with intense contractions that were 2 minutes apart. I came in talking and laughing. Laughter is a coping mechanism for me. They must have thought I was in an okay state. They took my signs and took their time. 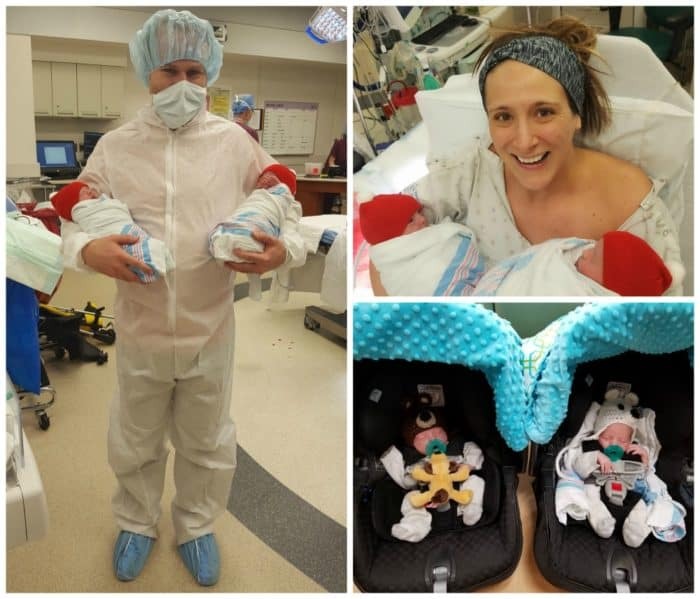 It was a quiet night at the hospital, and twins caught them by surprise. The doctor on call had not called back nor arrived**. **We later learned that the second he heard we were having twins on the voicemail, he hopped in the car and didn’t question anything else. He knew they were coming and that he had a forty five minute drive just to get to the hospital. Triage explained that, before I was going to be sent to a labor & delivery room, I needed an ultrasound to see the placement of Baby B. 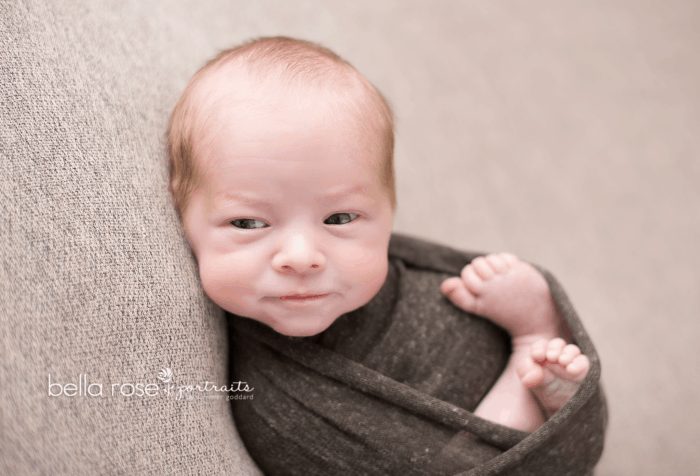 Baby B, Maxwell, had been switching back and forth from being head-down to transverse (sideways). In true form, Max was in his comfortable transverse placement. Then, a transition happened. Almost immediately, after the ultrasound, I began screaming for an epidural. Since the doctor had not arrived, the team would not give me one. They were unsure if I would go to labor & delivery (for laboring time) or straight to the operating room (for birth). In case of emergency, twin births happen in the operating room, whether vaginal or via c-section. The entire way, I kept telling whoever was around me, “They are coming!” I wasn’t taken very seriously. In the room, the anesthesiologist arrived within minutes. Maybe he had already been there. I don’t know. He asked me to sit up for a spinal, and I said I couldn’t as there was a baby coming out of me. 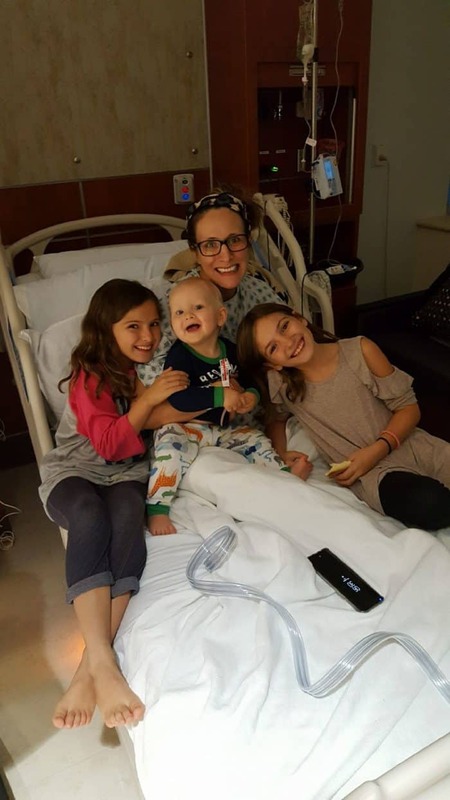 Sure enough, they took a look and with one push Henry arrived at 2:47 am with me three quarters on the operating table, the rest of me hanging on to the anesthesiologist. Wes wasn’t even in the room because he’d been sent out of the room to prep for a c-section. Rest. Where is My Husband? As soon as Henry was delivered, I got a period of rest. Thank God. It wasn’t long, but it was enough for me to gather enough strength and get my bearings. It had been about 20 minutes since I had last been able to see straight or know who was around me. Since leaving triage, everything was laser focus. My focus was on the doctor from the time he arrived. When I began to focus on other things in the room, I heard a nurse yelling, “she is falling off the table.” You see, I never made it all the way to the delivery table from the wheeled stretcher. I thought I delivered Henry with Wes scooping his own arms below my armpits. I didn’t. It was the anesthesiologist holding me up (I still don’t know his name – I wish I did!) My anesthesiologist thought he was there for an operation, but he was there as my support. He helped me delivery Baby A, his cart of medicine right beside him. Never used. Finally, sliding into position on to the table, I recognized this stranger of a support and began asking for my husband. In fact, no one realized my husband was missing except the one nurse who left him in a room to scrub up for this sons’ delivery. As I called for him, she delivered him into the operating room. Wes was delivered between Baby A and Baby B. The relief was short. Max was not head down. I will spare details, but Dr. Grimm used his hands to get Max into position. Still with no pain medicine, Max came at 2:54 am. Also, delivered with one push. There are a good handful of happiest days in my life. Every birth was pretty amazing. The day I married my husband was beautiful. This day, though, this day stands out. I had epidurals with all my other babies. Each time I reached the beginning of transition, I gave up. I asked for the medicine. I enjoyed those births. I enjoyed them because I experienced them. Mentally, I was present. This birth I had no choice. I birthed two babies with no medicine. I felt like a super hero. My endorphins were high. I felt powerful. I felt amazing… yes, I was tired… but I was full of joy and pride. This had been a long road. I long road with a beautiful ending. One push for the win. One push for the twin.